The Primary Years Programme ( PYP ) is a curriculum framework for young learners aged 3-12 designed by the International Baccalaureate (IB). Founded on a philosophy that recognizes a child’s natural curiosity, creativity and ability to reflect, the PYP generates a stimulating, challenging learning environment to nurture those assets and foster a lifelong love of learning in every child. The PYP, like all IB programmes, is transdisciplinary, meaning students learn across subject areas while investigating big ideas. and a school’s internal reflection process. The PYP is implemented school wide and adapted by teachers to meet the learning needs of all students. In most cases, the Middle Years Programme (MYP) is also a school wide program. All PYP teachers are required to participate in collaborative planning and reflection to make their teaching practices consistent and to foster a holistic approach to education. A growing body of evidence suggests a positive relationship between teacher collaboration and student achievement. Does implementing an IB programme mean my child’s school will not teach local or national standards such as the Common Core? The IB is committed to making sure that students in IB programmes meet and exceed local or national standards. With the implementation of any IB programme, schools are required to examine their curriculum carefully to ensure that there is alignment with local, state or national standards. More information on the IB and the Common Core is available at www.ibo.org. When do students start and finish the PYP? When do they transition to the MYP? Programme (CP) is for the last two years of high school, students aged 16-19. Speak with your child’s PYP classroom teacher. "We’ve been so impressed with the teachers’ attitudes and ambitions for the pupils. We really believed our children would do well here. IB methodology is so impressive and makes learning very easy than any indian curriculum like CBSE ... 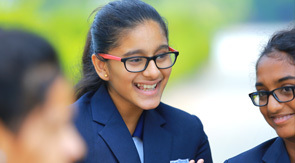 Thank you Manchester for offering IB and being an IB world school in India"